Each spinal nerve receives a branch called a gray ramus communicans (plural rami communicantes) from the adjacent paravertebral ganglion of the sympathetic trunk. The gray rami communicantes contain postganglionic nerve fibers of the sympathetic nervous system and are composed of largely unmyelinated neurons. This is in contrast to the white rami communicantes, in which heavily myelinated neurons give the rami their white appearance. Preganglionic sympathetic fibres from the intermediolateral nucleus in the lateral grey column of the spinal cord are carried in the white ramus communicans to the paravertebral ganglia of the sympathetic trunk. Once the preganglionic nerve has traversed a white ramus communicans, it can do one of three things. The preganglionic neuron can synapse with a postganglionic sympathetic neuron in the sympathetic paravertebral ganglion at that level. From here, the postganglionic sympathetic neuron can travel back out the grey ramus communicans of that level to the mixed spinal nerve and on to the effector organ. The preganglionic neuron can travel superiorly or inferiorly to a sympathetic paravertebral ganglion of a higher or lower level where it can synapse with a postganglionic sympathetic neruron. From here, the postganglionic sympathetic neuron can travel back out the grey ramus communicans of that level to the mixed spinal nerve and on to an effector organ. The preganglionic neuron can pass through the paravertebral ganglion without synapsing, and therefore continue as a preganglionic nerve fibre until it reaches a distant collateral ganglion anterior to the vertebral column. At the distal ganglion, it can synapse with postganglionic nerve fibres responsible for innervation of the pelvic viscera. From here, the postganglionic sympathetic neuron can travel out the grey ramus communicans of that level to its visceral effector organ. Ganglionic influence can be specifically targeted to end organs as well as becoming part of a summating systemic response. If the response is the whole body response, as in sympathetic fight or flight, the signals are distributed to other spinal nerves by way of gray rami communicantes which serve as conduits between the spinal nerves. Thoracic ganglia send grey rami communicantes to their adjacent body wall. They supply blood vessels, sweat glands, and arrectores pilorum muscles. Lumbar ganglia have grey rami communicantes that rejoin the appropriate spinal nerves to supply the abdominal wall and lower limbs. The pelvic ganglia form grey rami communicantes whose lateral (postganglionic) branches supply the pelvic wall and lower limb. Wilson-Pauwels, Linda; Stewart, Patricia A.; Akesson, Elizabeth J. (January 1997). Autonomic Nerves. Canada: B. C. Decker, Inc. pp. 71–104. ISBN 978-1-55009-030-7. 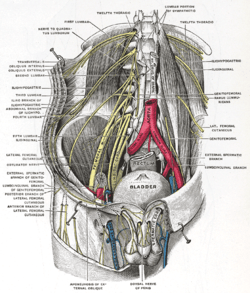 Deep and superficial dissection of the lumbar plexus. 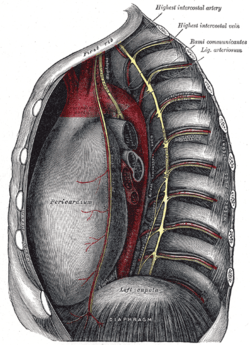 Thoracic portion of the sympathetic trunk.